Zirconium is a chemical element wi the seembol Zr, atomic nummer 40 an atomic mass o 91.224. The name o zirconium is taken frae the mineral zircon, the maist important soorce o zirconium, an frae the Persian wird "zargun - زرگون", meanin "gold colored". 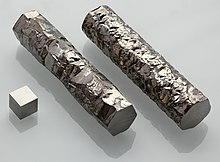 It is a lustrous, grey-white, strang transeetion metal that resembles titanium. Zirconium is mainly uised as a refractory an opacifier, altho it is uised in smaa amoonts as an alloyin agent for its strang resistance tae corrosion. Zirconium forms a variety o inorganic an organometallic compoonds sic as zirconium dioxide an zirconocene dichloride, respectively. Five isotopes occur naiturally, three o which are stable. Zirconium compoonds hae na kent biological role. ↑ Pritychenko, Boris; V. Tretyak. "Adopted Double Beta Decay Data". National Nuclear Data Center. Retrieved 2008-02-11. ↑ Harper, Douglas. "zircon". Online Etymology Dictionary. This page wis last eeditit on 31 August 2017, at 17:44.